Missions to help people find their true humanity and to know the mercy of Christ and friends, always needs our personal attention: friendship, prayers & study and financial assistance. Can I get you thinking about the foreign missions by personally undertaking some work to know the good work of missionaries and the work of the Holy Spirit? Consider this blog post a seed planted: make a plan to go to the missions for period of time (even for a week), support a project with friendly letters, human contact and financial support and most certainly with your prayer to the Saints Francis Xavier, Therese of Lisieux and Josephine Bahkita for their intercession before God’s throne. In all the consider you make, perhaps you may want to pray the Memorare to the Blessed Virgin Mary. Feeling a call to serve as a missionary in the Sudan, one of Africa’s incredibly poor countries, Father Herald Joseph Brock, CFR asked his superiors if he could serve the Church in Sudan. With tremendous generosity of the Friars of the Renewal and friends, Father Herald is rocking on… Father Herald writes a blog, “CFR Sudan Mission,” to keep friends engaged in his projects. 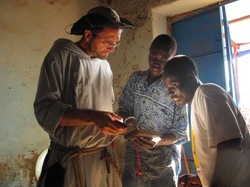 Making donations to the Franciscan Mission Outreach –CFR Sudan Mission can be done here. Last September I made a plea for help for the Mission. 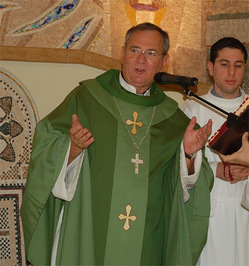 Bishop Luigi Padovese, OFM Cap, 63, was murdered today at about 1pm local time by his driver who it is claimed had psychological problems and history of violent outbreaks was supposedly a convert to Christianity but some news agencies are naming the driver a Muslim. At the moment no one is claiming political motivation for the murder. Bishop Padovese was born at Milan, Italy and a member of the Capuchin Franciscan order. He was ordained a priest for nearly 37 years and a bishop for 5.5 years. He was the Vicar Apostolic in Anatolia. Bishop Padovese was to meet Pope Benedict XVI with other Middle East bishops in Cyprus to receive the Instumentum laboris, the working document for the forthcoming Synod of Bishops, scheduled to meet in October. The Minister General of the Capuchins posted this brief bio for Bishop Luigi. The BBC story noted here and Spero News here. May God grant mercy Bishop Luigi Padovese mercy and may his memory be eternal. and our need for God. distracted by the things of this world? the shoulder and calling us back to Him. only place where we can be guaranteed to encounter God. auxiliary bishop of Newark. 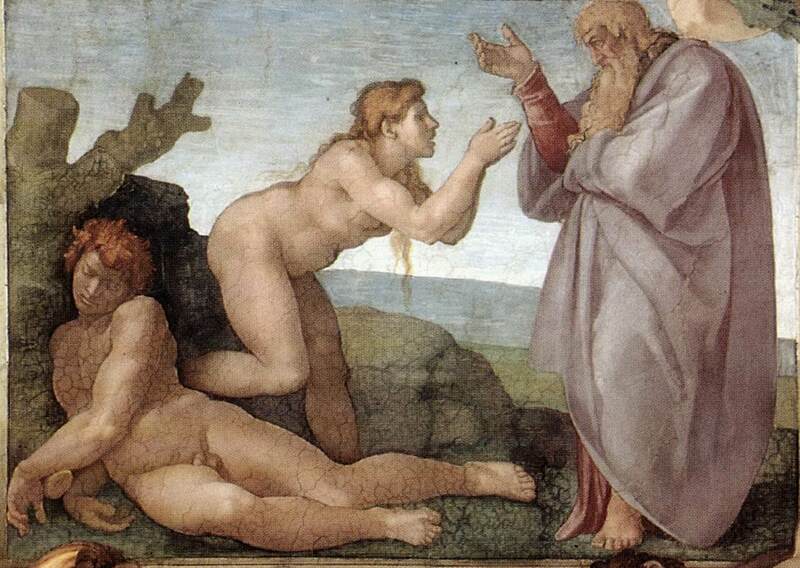 A poem of Brother Jeremiah’s, “After Eden,” was published here. 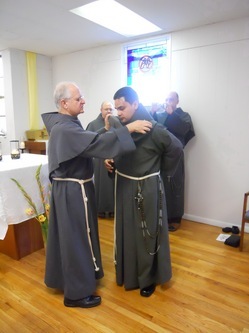 Yesterday morning (May 8) my friend Gabriel Scasino was invested in the habit of the Order of Friars Minor Conventual (OFMConv) at Saint Bonaventure Friary (Forestville, MD) during Lauds. His Minister Provincial, Father Justin Blase, presided at Lauds, blessed the habit, and then invested Gabriel with the Habit. Father Justin then celebrated the Holy Sacrifice of the Mass. Friar Gabriel belongs to the Immaculate Conception Province. clerical shirt of some sort. Nevertheless, most religious orders of men and women have a habit, usually some stylized clothing of a former era, though some sisters and priests may wear secular clothing because the founder didn’t specify a habit because of the era in which the congregation was founded (e.g., Missionary Servants of the Most Blessed Trinity) or like Saint Ignatius of Loyola who told his disciples to dress as the respectable priests of the day. Orders like the Benedictines, Carmelites, Augustinians, Dominicans and the Franciscans have a habit to identify themselves as living as the poor: simple attire. The habit is a witness to someone greater than me; and believe it or not, the habit often opens more doors to Christ than one might realize because many people recognize a habit as a garment that expresses virtue. The use of the habit may depend on the context in which the religious is living and working. In some cases color and type of fabric may be relative. However, what is clear is that the habit is not optional; it is not circus clothing, it is not for dress-up. The habit ought to help the person wearing it to take into account his or her life in Christ, preaching the Gospel and living the vows. 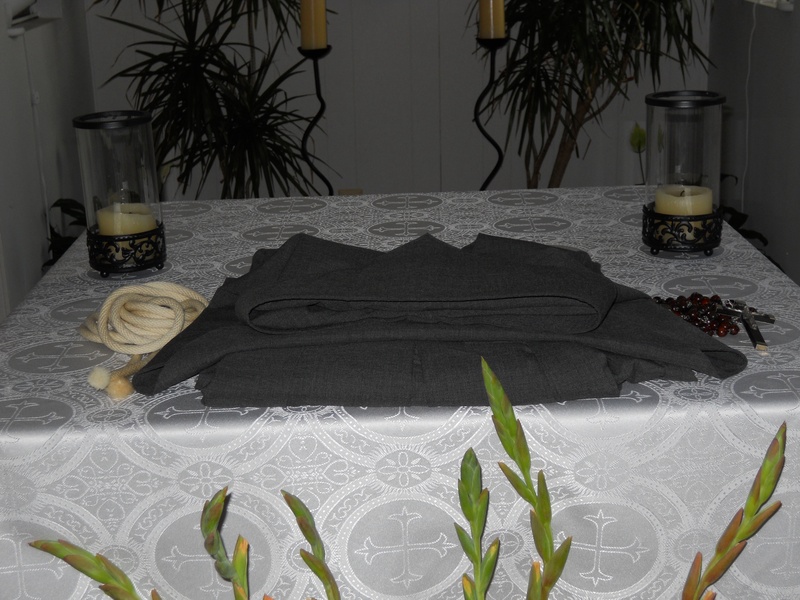 The religious habit of the friars, the sign of our consecration and of our community and a witness to poverty, must be simple and modest, poor and becoming. It consists of a black tunic with a capuche and a white cord. In certain places, for a reasonable cause approved by the Minister General with the consent of his definitory, the grey habit may be worn. According to custom, it is laudable to wear –suspended from the cord– the Franciscan crown of the Blessed Virgin Mary. 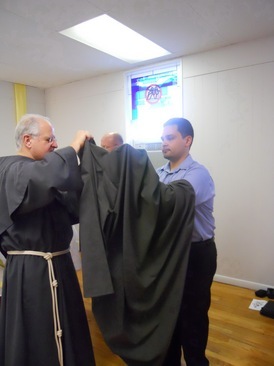 The friars must wear the habit of the Order. The Minister General, however, for particular reason and as long as these last may permit another form of dress (97; emphasis mine). As you can see from these photos, Friar Gabriel and his conferes are wearing the grey habit, which the other Conventual provinces around the world are beginning to adopt as it is seen as the more authentic habit of the Conventual Franciscans. Friar Gabriel Robert Scasino and I are from the same town, when to the same high school and our home parish is the same, though Gabriel is much younger than I am. He was a Conventual Franciscan for 7 years has been out for about 7 years and has been mercifully and graciously been re-admitted to the same. 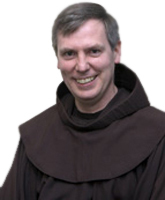 Beginning next week Friar Gabriel will spend 3 months in Assisi, Italy, doing a Franciscan course of study with the aim of putting him in touch with the Franciscan way of life by locating himself at the heart of Franciscan life. 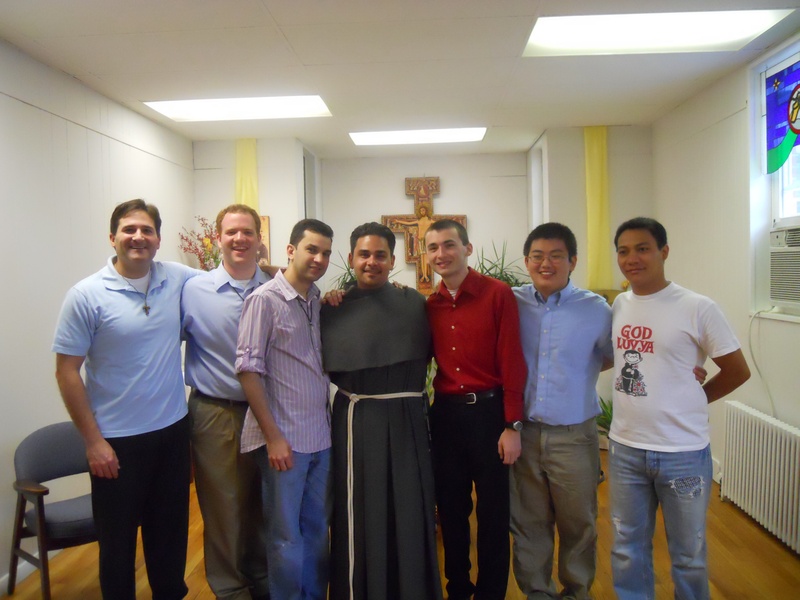 Friar Gabriel will make a profession of temporary vows on the feast of Saint Joseph Cupertino, September 18. May God grant Friar Gabriel many years as a Conventual Friar. Not long ago President Obama appointed Franciscan Brother Daniel Sulmasy, MD, to the Presidential Commission for the Study of Bioethical Issues. He’s universally well-received for his competence, compassion and humor. Oh, yes, the President did appoint a Catholic, a religious and a pro-life member to the commission. 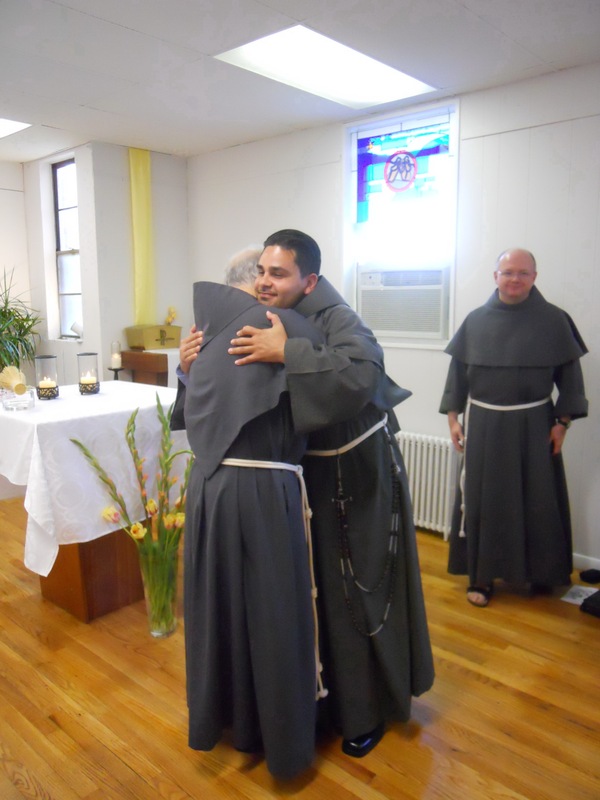 Brother Daniel is a professed member of the Order of Friars Minor of the Holy Name Province and he’s a friend and collaborator with Communion and Liberation. He spoke at the first annual New York Encounter in January, 2010. Until last year he worked here in NYC until he took a job at the University of Chicago. The National Catholic Register ran an article on Brother Daniel.